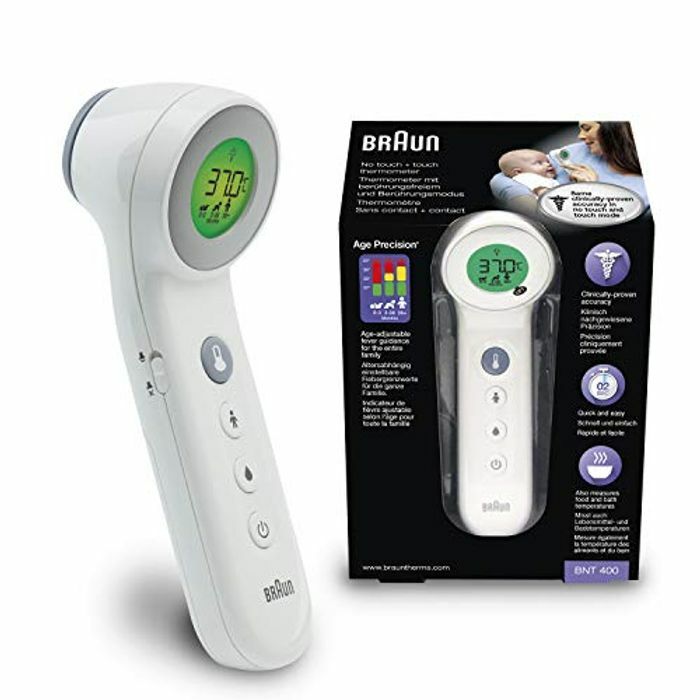 The No Touch + Touch thermometer with Age Precision is the latest addition to the Braun thermometer range. It features patented Age Precision technology, an age-adjustable fever guidance which takes the guesswork out of the temperature reading. This thermometer uses patented breakthrough technology to make taking temperature easy, stress-free and incredibly accurate. In Touch mode, place the thermometer on the forehead between the eyebrows to take a measurement. In No touch mode, hold the thermometer in front of your child's forehead between the eyebrows up to 2cm away, therefore reducing stress for your child. The temperature can then be taken without risk of waking them. The no-sound mode can also be used so that your child's temperature can be taken almost silently. Finally, the Food & liquid mode allows you to easily measure your baby food, drink or even bath temperature.